The cultivation of rice—the staple food for India, as well as for approximately half the world population—is critical to the culture, sustenance, and livelihood of many people. In 1942, a devastating epiphytotic brown spot disease broke out in the rice fields of Bengal Province. The resultant rice shortage and great Bengal famine of 1943 prompted the government of India, through the Indian Council of Agricultural Research (ICAR), to establish the Central Rice Research Institute (CRRI) at Cuttack in Odisha state. CRRI was challenged with the goal of increasing rice production. Through the research efforts of ICAR (including CRRI and others) and Indian agricultural universities, India emerged from a near-famine situation to become the second-largest rice producer in the world. With this great leadership role, however, came a sizable responsibility to the nation, as well as to the global community, to monitor the effects of India’s rice production. Because of population growth, the global demand for food was rising, causing Indian rice farmers to strive to produce more yield without consuming more resources. Added to this burden was the increasingly difficult and unpredictable growing environment caused by altered weather patterns due to climate change. These challenges were intensified by the mounting pressure to reduce rice farming’s environmental footprint. How could the CRRI help close yield and efficiency gaps, and increase the income level of rice farmers, while protecting the environment? Seeking answers, ICAR launched two climate-change projects—the National Initiative on Climate Resilient Agriculture (NICRA) and the National Agricultural Innovation Project (NAIP)—part of which has been conducted by CRRI at Cuttack. 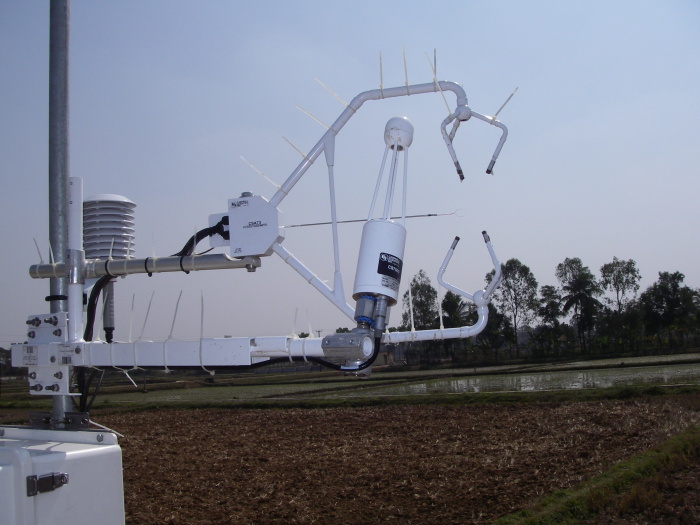 A focus of the field study was to use an open-path eddy-covariance system to investigate the exchange of greenhouse gases (GHGs), specifically carbon dioxide (CO2) and methane (CH4), in relation to the ecosystem carbon (C) balance in rice paddies (flooded and other ecologies). As India planned to meet the increased requirements for food output, would its greater rice production release harmful levels of CH4 or CO2 into the atmosphere? CRRI worked with Campbell Scientific to configure and install an eddy-covariance system in the middle of a lowland flooded rice field near the institute’s main facility in Cuttack. The system, designed to provide continuous gas monitoring, comprised a CSAT3 3D Sonic Anemometer, a CO2/H2O open-path gas analyzer, an open-path CH4 analyzer, a CR3000 Micrologger, and a variety of sensors: air temperature and relative humidity, net radiometer, soil temperature, soil heat flux, and soil moisture. Using CompactFlash memory cards, measurement data could be transferred manually from the CR3000. Installing the eddy-covariance system was challenging for two reasons: the monsoon season was characterized by strong winds, and the rice paddies were mucky. To overcome these challenges, the system was attached to a large brick and concrete platform, which prevented the equipment from blowing away or sinking. A second system was later installed at ground level in a homogeneous, flat rice field. In flooded rice fields, the CO2 concentration in the atmosphere was highest in the early morning and at a minimum in the late afternoon. During the day, throughout the wet and dry seasons, the lowland flooded rice paddies stored C in soil and behaved as a net C sink. During the night, the lowland flooded rice paddies acted as a C source. Although CH4 is a source of C loss from lowland flooded rice ecosystems, this ecology has good potential to store a considerable amount of C.
CRRI has continued to monitor the rice paddies to further develop their understanding of processes that can help manage the CO2 and CH4 flux. The institute remains committed to protecting the environment, while providing a livelihood for the Indian farming population and food for the world.